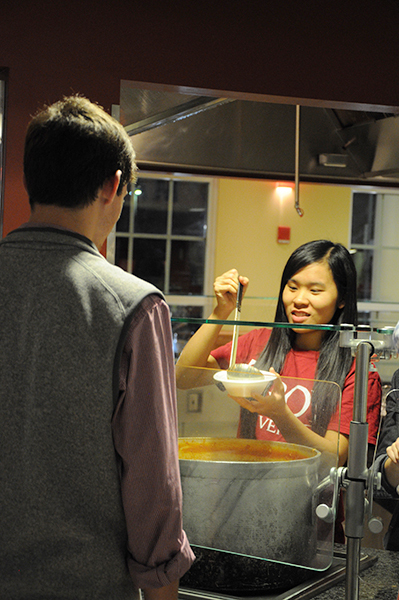 Civic Scholars put on their own “SOUPer Bowl” this year to raise awareness of hunger and poverty in Pike County. While millions of Americans sat around watching the Super bowl on Sunday, Feb. 3, 43 students of Troy University watched the game on the TVs in upstairs Saga: for a cause. “So that means that four out of every 10 children don’t know where their next meal is going to come from,” said Cesar Jauregui during a commercial break. Jauregui, a sophomore broadcast journalism major from Pell City, was one of the three civic scholars responsible with spearheading the event. On the wrap-around serving counter sat 90 cans. These cans were used as an entrance fee for the event and would then be donated to the local Salvation Army food bank. For each can that was donated, students received one ticket that went toward a drawing for a Nook tablet donated by Barnes&Noble as well as other donated prizes. Timothy White, a freshman exercise science major from Madison was the winner of the tablet. “I was stoked to win it,” White said. Not only did students raise canned foods for the community, they also received soup, chips and salsa courtesy of Sodexo at the event. Many of the participants in the SOUPer Bowl event had different views on local poverty and how they could be part of the solution. “Not all Americans are very aware of how food is important and how precious it is,” said Bui Hoang Yen a sophomore accounting major from Hanoi, Vietnam. The idea of a SOUPer Bowl event actually came from civic scholar Amanda Langley a freshman broadcast journalism major from Kennesaw, Ga.
Langley’s high school held a similar event and she said it would be a great way to bring college students together for a cause. “But, as a college student, you are going to be living here for so many years that it is important to give back,” Langley said. Thuy Nguyen, a freshman broadcast journalism major from Hanoi, was another one of the civic scholar students that lead the event. “I come from a country where people are really poor,” Nguyen said. Nguyen said that this event was her fist chance to join in and help with the issue. “I applaud Cesar, Amanda and Thuy for their successful event,” said Jonathan Cellon coordinator of service learning & civic engagement at Troy University. At the end of the event, Cellon encouraged students to keep up to date on all of the upcoming civic scholar events through social media and to get involved. For more information on upcoming civic scholar events you can visit the civic scholars Facebook page at: Office of Service Learning & Civic Engagement | Troy University. And follow them on twitter at @Troy_Service.